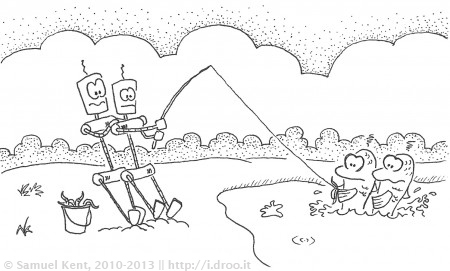 #448 – No, you let go! It was my worm first! Seriously, robots and fishes: there are enough worms for everyone. And maybe then some. The world, it seems, is literally (and figuratiively) crawling with ’em. You may have noticed that I’ve been working on updating this site design as well as scanning, re-touching and re-liading the oldest doodles. Thanks for standing by in the interim. As that project nears its ends, I’m happily returning to the daily doodle grind!